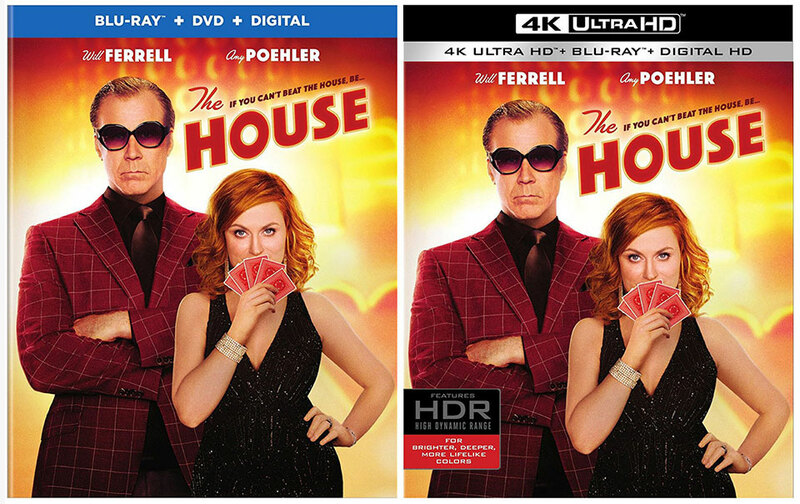 Warner Bros.’ summer comedy The House starring Will Farrell & Amy Poehler will release to Blu-ray Disc and Ultra HD Blu-ray on Tuesday, Oct. 10. The film is already available to purchase in digital formats, but may not include all the extras on the Blu-ray combo packs that come with a DVD or Blu-ray and Digital Copy. On Blu-ray the film is presented in 16×9 (2.4:1 aspect ratio) at 1080p (Blu-ray) and 2160p (4k Blu-ray likely with HDR via HDR10). The soundtrack on the Blu-ray Disc plays in DTS-HD Master Audio 5.1 channel with subtitles available in English, French and Spanish. We’re waiting for confirmation on whether or not the 4k Blu-ray will include Dolby Atmos. Extra bonus materials include the featurettes “The House: Playing with a Loaded Deck” and “If You Build The House They Will Come,” as well as deleted, extended, and alternate scenes, gag reel, and Line-O-Ramas. A Digital HD copy is also provided via a redemption code for UltraViolet (which unfortunately does not include an iTunes file), and we’re hoping the code will provide a Digital UHD (4k) copy with Vudu. The redemption code has an expiration date of Dec. 31, 2018. The House is list-priced at $35.99 (Blu-ray) and $45.99 (Ultra HD Blu-ray) but Amazon is taking pre-orders on the Blu-ray combo for $24.99 (see current pricing below).